Romney supporters, including members of the conservative press, have made the same argument. And while harsh coverage of Romney’s statements on Libya were the catalyst for these complaints, the problem supposedly goes back further than that. 1) The deceptions. The most conspicuous change in media coverage that I noticed occurred sometime in mid-August. And it was in response to repeated statements, in speeches and in advertisements by the Romney campaign, that Obama had “gutted” the work requirements in welfare reform. Virtually every independent expert who examined the allegation had found the allegation baseless, but Romney kept using it. Confronted with this, an anonymous Romney adviser indicated the campaign didn’t care what fact-checkers think, because they bring their own biases. (The advisers were right: Fact-checkers do have their own biases. But the welfare claim happens to be dishonest anyway.) At that point, even reporters at non-opinion news outlets, the kind that typically make such efforts to seem even-handed, began stating that Romney was not telling the truth. When Paul Ryan gave a speech full of deceptions, reporters called him on that, too. 2) The evasions. Romney keeps saying that he has better ideas for the country than Obama does. But Romney keeps refusing to specify what those ideas are. Most obviously, he has promised to reduce federal, non-defense spending to 16 percent gross domestic product—a level that would require ludicrously steep cuts to programs affecting not just the poor but the middle-class as well. At the same time, he’s vowed to rescind the cuts Obama made to Medicare. So where would Romney find the money? He won’t say. Romney has also vowed to cut taxes, particularly for the wealthy, without adding to the deficit burden. He says he can do that by closing loopholes, but he refuses to say which loopholes he’d close—perhaps because, as the Tax Policy Center has demonstrated, it’s impossible to do without raising taxes on the middle class. Confronted with these evasions, Romney has said he doesn’t want to provide details because it’d give his opponents grist for attacking him. How else should the media report this? 3) The polls. Here I’m sympathetic to Romney and his supporters. The media is way too obsessed with horse-race coverage. As a result, journalists are prone to write more negative stories just because a candidate’s political position is slipping. Still, the state of the campaign is part of the story. And the polls are probably the best indicator we have of how the campaign is going. 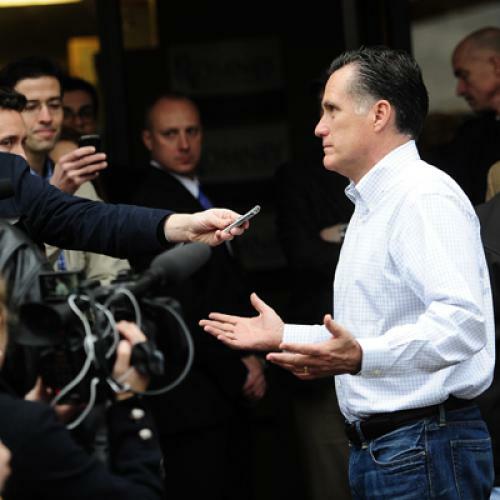 Romney’s polls have been falling: That’s now beyond question. The media shouldn’t dwell on that, I agree. But it’s an important development and not possible to ignore. Fine. But couldn’t the media be tougher on Obama? I’d argue they have been plenty tough. Studies of the Affordable Care Act have shown the coverage was overwhelming negative. I haven’t seen similar studies of coverage of the Recovery Act, but consider this: How many stories have you read or heard about the jobs that the Recovery Act virtually every mainstream economist believes the law created? How many have you seen or read about the law's efforts to boost the economy in the long run—for example, the project to create electronic medical records? And, then, how many have you seen or read about Solyndra, which was one modest part of the program? Mike Grunwald’s book, The New New Deal, has helped bring the Recovery Act’s successes to light. But, overall, the coverage has been negative. And while Obama or his supporters have also made statements that deserve scrutiny, they’ve done so far less frequently or blatantly—and they’ve received plenty of criticism for them. Just go back and read the media reaction to the ad, by Obama supporters, featuring the former steelworker whose wife eventually died from cancer. Obama ended up disavowing the ad, even though his own campaign hadn't run it (an outside group had) and, strictly speaking, it said nothing that was inaccurate. Just to be clear, I’m not dismissing the possibility that a liberal bias has altered media coverage, by affecting what journalists cover if not how they cover it. I’m not conceding the point, either. But whatever role that bias may or may not have played, the main reason that Romney’s coverage makes him look bad seems pretty clear to me. He’s running an evasive, dishonest campaign and reporters are calling him on it. As they should. Update: In an interview with George Stephanopoulos of ABC News that aired Friday, Romney again refused to answer questions about how, in theory, he'd reconcile the conflicting goals of his tax plan. Kevin Drum has the details. Also, for a full accounting of Romney deceptions, you can read the latest compilation of "Mitt's Mendacity" by Steve Benen.